Location, location, location. Anyone who attended or followed the 2010 SXSW festival understood that the hot topic was “geolocation”. 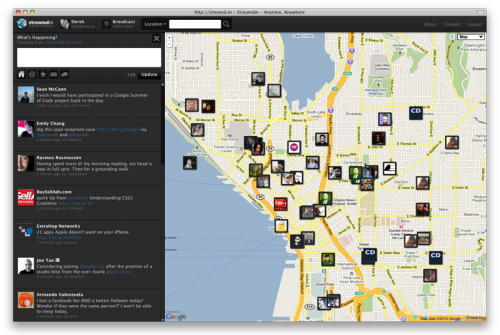 Twitter officially enabled geolocation on streams providing users with the option to include their current location with messages, Foursquare is reporting crazy new user numbers and Gowalla is reporting their own activity numbers from SXSW. So with the recent focus on geolocation, there could be no better time to launch Streamd.in. For now, Streamd.in focuses on content originating from Twitter. However, future layers will include updates from Foursquare, Brightkite and Flickr. Follow @streamdin on Twitter to find out when new features roll out. For ideas, feedback or questions feel free to get in touch. What are your thoughts regarding geolocation? With the recent attention that Please Rob Me received and the increased risk of openly sharing your location, where do you stand on the popular trend of openly sharing where you are? Newer: AT&T 3G MicroCell, who is doing who a favor?